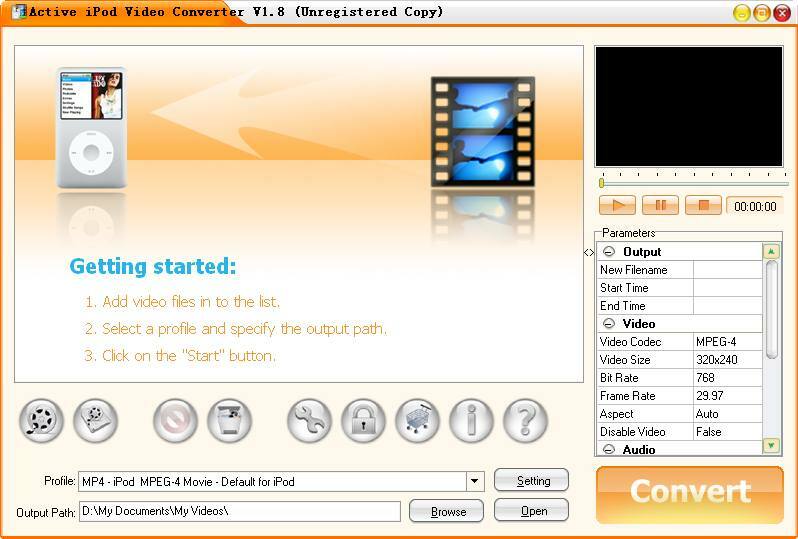 Active iPod Video Converter is the world's best video software for iPod video (MP4,H.264) conversion. As iPod,iPod Touch,iPhone video converter software, Active iPod Video Converter can convert iPod,iPod Touch,iPhone videos from popular video files, such as AVI, MPEG, MPG, WMV, Xvid, DivX, ASF, MOV, VOB, etc. Video Preview and other functions make it more convenient to use. In a word, Active iPod Video Converter is the best choice. ...... With variable settings and super fast converting speed to convert video formats, it is an affordable, perfect video converter with high quality. Active iPod Video Converter will give you a new and wonderful experience of converting video. World's best video software for all popular video formats conversion. Qweas is providing links to Active iPod Video Converter 1.8.1 as a courtesy, and makes no representations regarding Active iPod Video Converter or any other applications or any information related thereto. Any questions, complaints or claims regarding this application Active iPod Video Converter 1.8.1 must be directed to the appropriate software vendor. You may click the publisher link of Active iPod Video Converter on the top of this page to get more details about the vendor.